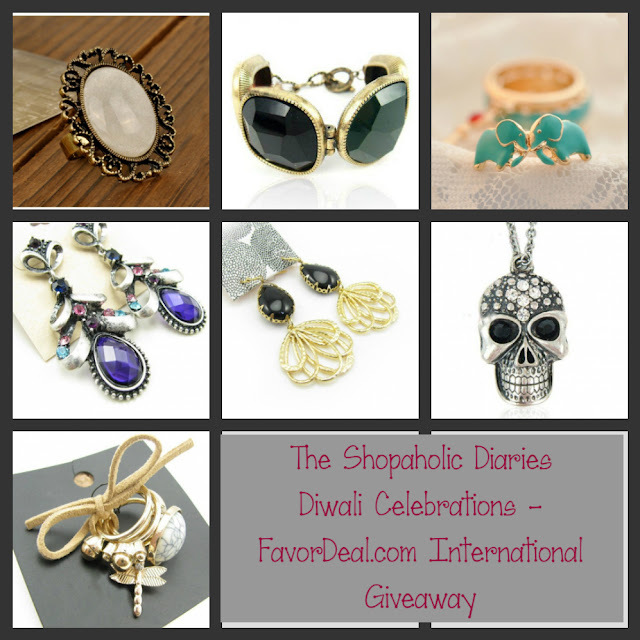 The Shopaholic Diaries - Diwali Celebrations - Favordeal.com International Jewelry Giveaway | The Shopaholic Diaries - Indian Fashion, Shopping and Lifestyle Blog ! So, as I mentioned in the last post that I am leaving for home to celebrate Diwali with my family today, I thought why should I not celebrate Diwali (which is one of the main festivals we celebrate here in India) with my friends and followers as well. Diwali in India is about traditions, culture and lights - and Jewelry is also a main part of the festivities as buying jewelry especially Gold during Diwali is considered very auspicious. So, I collaborated with FavorDeal.com to bring you an International Giveaway where 3 winners will win absolutely gorgeous Jewelry! Isn't it the perfect Diwali gift this season? Sign up to FavorDeal.com and comment to let us know you have done so. You must sign up so that we may credit your account if you win. Do leave a COMMENT Below in the Comments Box, mentioning that you have entered and giving your GFC Name. For extra entries, you can Like my Facebook page, Follow me on Twitter, Follow me on Pinterest and Share this Giveaway via Blog Post / Blog Sidebar. All the steps are given in the Rafflecopter gadget which would enable me to track the entries. The Giveaway would run from today ie. November 11, 2012 to December 5, 2012. There would be THREE WINNERS and it is open INTERNATIONALLY! So, enter today to win amazing Jewelry by FavorDeal.com, and be a part of my Diwali Celebrations. the picture url u gave here is not the right one...plz check.. Thanks for telling Snigdha, I have corrected it! Amazing accessories! Love the earings! I have entered and done all steps. Check out mine about MAISON MARTIN MARGIELA FOR H&M! Maybe follow each other if you like? Wish all of you a happy and prosperous Diwali.May this Diwali bring lots of happiness to your life..
We love favordeal, thanx for the great giveaway! I have done all steps!!! I have a friend who is a chef who was just cooking up a storm to celebrate Diwali! Entered and completed all the steps.